The residential noise issues that we field questions about that relate to mechanics are featured below. If you don’t see your particular application listed, call our help desk at 1-800-638-9355. Outdoors, Pool Pumps and Air Conditioning units receive our popular QBO sound barrier blanket systems, while indoors, our NetLag sound barrier lagging is popular for wrapping around drain pipes and ductwork. QBO Sound Barrier Blankets are designed to both block directional noise and hold up in the weather for lasting mechanical noise control. This makes for an ideal sound enclosure project for any stationary outdoor noise source, including pool pumps, AC units, generators, and more. The blankets are custom cut to the cavity size of any framing or fencing you construct around your noise source, and are simple to attach / detach as needed for maintenance. Soundproofing your furnace room can prove tricky. Regardless of your best efforts to contain the noise to within the room, the fact remains that this is a mechanical room with pipes and ductwork that produce openings for noise to bleed where it wants to go. The best you can do is to attempt to better control that bleed, first by applying QBS Sound Barrier Blankets where you can to perimeter wall and ceiling surfaces and the back of your door. The QBS Blankets block noise bleed. We will cut the blankets to the cavity size you seek, and include a field stitching kit for field cut applications. To compliment the QBS Blankets, FireFlex Foam Panels are class A fire rated, and can be glued to available surface space inside the furnace room to help absorb the trapped energy that will otherwise escape through your ducts and pipes. Drain pipes from flushing water can create unwelcome noise at work or home. If you have access to the pipes, there is a sound barrier lagging material that you can jacket around the pipe to hold the noise to within. The product is called NetLag, and can ship to your project site in 54 x 30’ rolls. 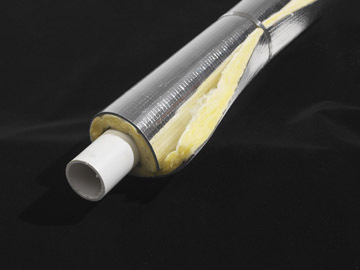 If you do not have access to the pipes, a dB-Bloc barrier treatment can be applied to your wall or ceiling surface that currently hides your pipes. The best mechanical noise reduction technique is to move the treatment as close to the noise source as possible. You should consider opening up your drywall, and wrapping the pipes direct with NetLag. Ductwork that carries air flow will allow noise to break through the walls of the duct and spill out into your room. 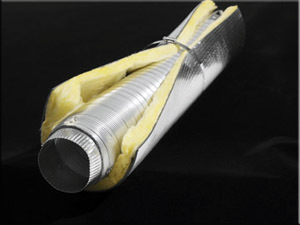 To combat the transmitting noise, wrap your duct with NetLag. As with the drain pipes above, NetLag also works to sound isolate the noise stemming from wind tunnels of airflow transferring through your ductwork. Note that the treatment does NOT block sound from pouring out the mouth of the supply and return vents. For those who ask, we recommend using coiled ductwork that can twist and change direction, forcing the noise waves to have to work harder to travel through the ductwork. There are also induct silencers that can be custom cut to retrofit into the duct, although with varying levels of success. There are also ducts available in today’s market that have their interior walls prelined with insulation, but NetWell does not sell the treatment. Only the NetLag.